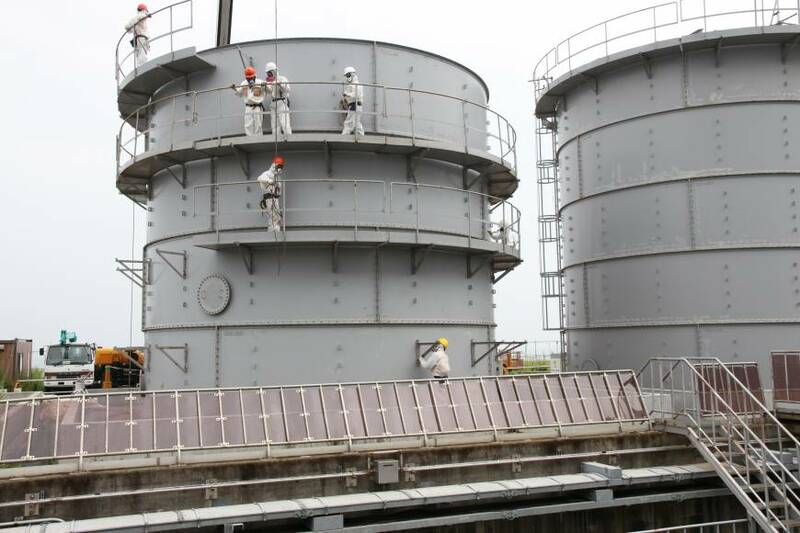 Tokyo Electric has a plan to better monitor the 930 radioactive water tanks at its Fukushima No. 1 plant, but it is unclear whether it will be able to lock down the storage problem before the trickle turns into a flood. The tainted water generated by the makeshift cooling apparatus set up after the nuclear meltdowns has become the second stage of the nuclear crisis for beleaguered Tokyo Electric Power Co., which is unable to protect the Pacific Ocean from its radioactive waste and is coming under increasing pressure to seek outside help. The immense volume of the water forced Tepco, as the utility is known, to build storage tanks at a rapid pace, but some are dangerously prone to leaks, as well as major quakes, and the safer ones can’t be built in time to help, experts say. Compounding the problem is Tepco’s inability to quickly confirm the amount of water in the tanks or determine where it is leaking from. To attack the water crisis, Tepco President Naomi Hirose announced Monday that a new team for the tank issue will be formed and put directly under his control. “We will spend the necessary resources and equipment to firmly deal with the issue of the tanks . . . We recognize this as an extremely important issue for the company’s management,” Hirose said in Fukushima. The measures include increasing the number of workers used to patrol the storage areas, installing water gauges in the tanks, and eventually replacing the leakier flange-type tanks with welded ones that are more watertight. Tepco’s monitoring of the tanks has drawn fire from experts and regulators alike. Its patrols had consisted of two people conducting visual checks of the 930 tanks set up for the water so far in just two to three hours, twice a day. Since the estimated 300 tons of tainted water lost in the most recent leak probably escaped over a month before it was discovered on Aug. 19, the Nuclear Regulation Authority put the patrols under intense scrutiny. Starting next Monday, Tepco said it will conduct three patrols of 30 people each during the day but only use four people at night. The tanks, however, are a different problem. At the moment, Tepco has no choice but to continue using flange-type tanks, which have been involved in at least three other leaks, for the immediate future. About 300 of the 930 tanks on site are flange-type units consisting of steel plates bolted together and sealed with waterproof packing at the seams. The tanks, about 10 meters high and 12 meters in diameter, are less watertight than those made with welded seams because of the multitude of bolted parts, which could turn into leak points. Tepco has no idea how the water in the 300-ton leak escaped, but on Friday it said that any hole in it is probably somewhere in the bottom and about 25 mm long by 1 mm wide, based on the 5 cm the water level dropped within six hours on Aug. 20. No holes have been found yet. “I don’t know if this is because of corrosion or deterioration, something needs to be done to the bottom part, otherwise it is possible the water will leak from other spots,” said senior NRA official Masaya Yasui during a meeting on the issue Tuesday. Corrosion is a possibility because the tainted water contains salt from seawater used to cool the reactors and spent-fuel pools in the early stages of the crisis. It also ruined the reactors. Tepco plans to transfer the tainted water from the flange-type tanks to welded tanks but has not developed a schedule yet because of complex logistic issues. One of these issues is the lengthy assembly time required for a welded tank, which take about six months to put together and set up. There are 300 tanks to replace. Another issue is the salt. “Salt is a problem. The tanks are not made of stainless steel but just steel, so they will get rusty,” said metals expert Hiromitsu Ino, professor emeritus at the University of Tokyo. Ino said, however, that it will take years for the tanks to rust out, making that more of a long-term issue. 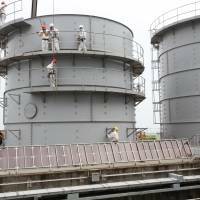 Kazunari Yoshimura, a water expert who runs the consultancy Global Water Japan, said the salt issue will force Tepco to apply a protective coating to the tanks, which will lengthen the build time. In addition, if the welded tanks are built hastily, and shortcuts taken, poor welds could lead to more leaks. Meanwhile, there is the looming question of whether the storage tanks can survive major earthquakes. Tepco said it is “debatable” whether the tanks can withstand a quake as strong as the one on March 11, 2011, but they are designated as having class-B quake resistance, which is the second-highest rating under Japanese regulations and means they can weather relatively large quakes. The utility said the flange-type tanks were set up on concrete foundations unanchored because installing anchors would cause a quake’s power to focus on those spots, which it claimed would be dangerous.